‘Dark Wings, Dark Words’ Round-up: "The Kate Middleton of Westeros" and Bad News for the Starks — Making Game of Thrones " "
The second episode of Season 3 of Game of Thrones is full of revelations for characters and fans alike. 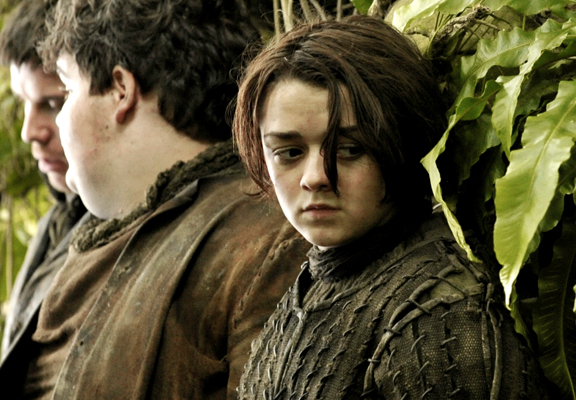 This week’s shockers focus on those trapped in bleak situations: Theon is imprisoned (and tortured) by a mystery captor, Arya is seized by the Brotherhood Without Banners, and Sansa is plied with lemon cake and cheese in exchange for her secrets. Then there are those who find themselves in surprising circumstances: The Lord Commander declares the survival of Sam and Rast to be interdependent, Brienne proves to be Jaime’s equal (much to his shock, as Nikolaj Coster-Waldau reveals in HBO Go’s interactive features) and Bran learns that he can see into the past, present and future. Dragons aren’t the only flying powerhouses in Westeros; Bran’s gifts come on the wings of the three-eyed-raven. This revelation is the only good thing going for the Starks right now. Robb learns Winterfell has fallen, and most likely, his brothers with it; news he must break to his mother. As Executive Producer D.B. Weiss explains in this week's Inside the Episode, Catelyn’s love for her family is actually for the members of her family, and not just a sense of honor or legacy. Unsurprisingly, word of her father’s death and Bran and Rickon’s disappearance leaves her noticeably shaken – a theme among the Starks right now. Alan Sepinwall of HitFlix.com notes this commonality; though the family is spread across Westeros, they’re connected by the shadow of Ned’s life and haunted by a ghost who didn’t survive his political mistakes. The pressure to play the game strategically pulses in Stark blood. While you await this royal wedding, catch up on family histories, houses and more in our Viewer’s Guide.